Executors of and estate, trustees of a trust, and guardians of incapacitated persons are all types of “fiduciaries.” Claims against fiduciaries fall into two broad categories: lawsuits by beneficiaries and lawsuits by third parties. Fiduciary Misconduct On occasion, beneficiaries of an estate may take issue with the actions of a fiduciary and make claims based upon the fiduciary’s alleged breach of duty, self-dealing or negligence. Such claims arise not only in the administration of trusts or decedents’ estates, but also in cases involving conservatorships or guardianships. Claims are sometimes made that a fiduciary has committed fraud or other wrongdoing, resulting in loss to an estate or trust. In such cases, a court may surcharge the fiduciary for breach of fiduciary duty, and order the fiduciary to repay the estate or trust from personal assets. Attorneys with the Law Office of Donald D. Vanarelli represent beneficiaries bringing such claims, as well as fiduciaries defending against whim claims are made. Claims by third parties may arise in a number of ways: claims relating to a decedent’s conduct before death, for which the estate remains liable; claims based on contracts entered into by a fiduciary in his fiduciary capacity; and claims by creditors of the estate. Another type of fiduciary is an agent under a power of attorney. A power of attorney is a document used to delegate legal authority to act on another person’s behalf. The principal (the person granting the power of attorney) gives the agent the authority to make legal decisions on his/her behalf, including managing bank accounts, real estate, and other assets. The potential for fraud exists in every power of attorney arrangement, through self-dealing, embezzlement, and unlawful gifting. An agent may significantly deplete an estate, leaving the heirs with little or no inheritance. Other ways in which a power of attorney can be abused include changing beneficiary designations on life insurance or annuities, and opening bank accounts with joint title or pay-on-death provisions in favor of the agent. The creation of a power of attorney can be challenged on the basis that the principal lacked mental capacity to understand and sign the the document, or that the creation of the document did not follow proper formalities. If a validly granted power of attorney has been abused by the agent, grounds may exist to sue the agent for the return of embezzled property or for monetary damages. If the principal is still living at the time of the action, the principal can sue the agent directly. If the principal has passed away by the time the power of attorney abuse has been discovered, the principal’s estate or the intended beneficiaries may sue the agent for breach of fiduciary duty, tortious interference with expected inheritance, or a number of other causes of action. In some situations, the ownership of joint bank accounts will be in dispute upon the death of one owner. Under New Jersey law, there is a presumption that jointly titled accounts become the property of the survivor upon the death of the first owner. However, this presumption can be disproven upon sufficient evidence to the contrary. In other situations, one owner of joint funds might have improperly transferred funds out of the joint account. In such a case, a lawsuit can be brought for the recovery of the joint funds improperly taken. A fiduciary – an executor, administrator, trustee or agent under a power of attorney – holds a position of trust and confidence. Because the fiduciary acts for the benefit of others, he or she must account for his or her actions. A fiduciary’s administration of an estate or trust is not concluded until the fiduciary submits a final accounting. It is the fiduciary’s duty to maintain and preserve accurate records of his or her actions. If the fiduciary is unable to prove or verify the fiduciary account, any doubts or irregularities will be decided against the fiduciary. Any beneficiary or other interested party may seek to compel a fiduciary to account formally, by filing the accounting via Order to Show Cause in court. The Law Office of Donald D. Vanarelli will assist beneficiaries with petitioning the court for accountings, and will prepare accountings for fiduciaries who are required to do so. Because of their extensive experience, the trusts and estates attorneys with the Law Office of Donald D. Vanarelli are well equipped to review and prepare accountings to ensure that our client’s interests are protected. If necessary, our litigators are prepared to question or defend fiduciaries and their accountings in court. Trusts and estates attorneys with the Law Office of Donald D. Vanarelli engage in sophisticated planning and administration of estates, trusts, conservatorships and guardianships. Our trusts and estates lawyers are frequently retained by fiduciaries to deal with complicated tax, estate and trust issues. Because of their experience and knowledge, our trusts and estates lawyers bring a comprehensive understanding to the intricate issues of trusts and estates law. Working together, litigators and trusts and estates lawyers with the Law Office of Donald D. Vanarelli bring the requisite experience and knowledge to a wide range of estate and probate litigation. Elder abuse includes any physical or psychological abuse of an elderly person, theft of an elderly person’s money or property, or the intentional or unintentional failure to provide care to an elderly person. The government estimates that 1.5 million elders suffer from abuse, while only 1 incident in 14 is reported. The average victim of abuse is a female, age 75 or older, with limited resources. Generally, the victim is widowed, frail and vulnerable because of mental or physical impairments, who resides with family. Sometimes the victim resides in an institution. The victim may have fewer alternatives to remove herself from the abusive situation because of her financial condition, health or age. Often, the abuser is the victim’s middle-aged child who is also the victim’s caregiver. The abuser may be the victim’s spouse or grandchild. An individual without close family may be exploited by a “friend.” If the individual resides in an institution, the abuser is often an employee of the facility, although another resident of the facility can also be the abuser. Broadly defined by the federal government, there are three (3) basic categories of elder abuse: (A) domestic elder abuse; (B) institutional elder abuse; and (C) self-neglect or self-abuse. A. Domestic elder abuse refers to any mistreatment of an older person by someone who has a special relationship with the elder (e.g., a spouse, a sibling, an adult child, a friend, or caregiver.) The most prevalent form of abuse is by younger family members who are responsible for the care of their elderly relatives. B. Institutional elder abuse refers to abuse that occurs in residential facilities for older persons (e.g., nursing homes, foster homes, group homes, etc.). Perpetrators of institutional abuse usually are persons who have a legal or contractual obligation to provide elder victims with care and protection (e.g., paid caregivers, staff, and professionals) C. Self-neglect or self-abuse is an act, or failure to act, by the elderly person which is life-threatening or which can lead to serious injury. Examples include the refusal to eat or take medication, the refusal to visit the doctor as directed, and the refusal to bathe or follow other basic hygiene routines. Financial exploitation, a type of domestic elder abuse, is defined as the illegal or improper use of an elder’s assets. Examples include but are not limited to cashing an elderly person’s checks without authorization / permission; forging an older person’s signature; misusing or stealing an older person’s money or possessions; coercing or deceiving an older person into signing any documents (e.g., contracts or will); and the improper use of a conservatorship, guardianship, or power of attorney. When a client is a victim of abuse, there are certain steps that can be taken to stop further abuse, such as obtaining an injunction, a restraining order, or an order removing or evicting the abuser from the victim’s home, or by filing a complaint against a facility or employee, or removing the victim from the facility. In cases where the victim is incapacitated, it may be necessary to petition the court for the appointment of a guardian, or to file a protective proceeding. In addition, the victim should consider filing criminal charges against the perpetrator of the exploitation. When the client is a victim of domestic violence, it may be possible to obtain a temporary restraining order or domestic violence injunction, or to commence a separate maintenance or divorce proceeding, depending upon the victim’s wishes. The attorneys at the Law Office of Donald D. Vanarelli have extensive litigation experience representing the victims of abuse, as well as defending against false claims of elder abuse. 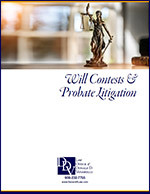 For additional information regarding Will Contests, Probate Litigation and Elder Abuse Actions, call us at 908-232-7400 or click here to contact us online.